I love when the 101 Action Movies brings me something I had never seen. I remember seeing the posters for this when I was a kid, but it never meant anything to me. Now though, I think I have found my fave Romero film after the original Night of the Living Dead. And this one is unlike any of Romero’s famed zombie films! 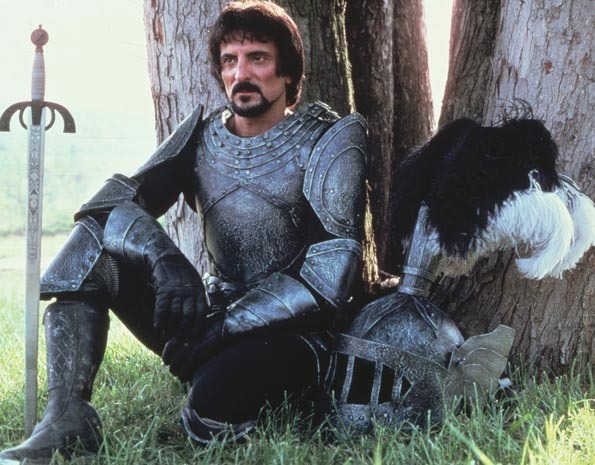 It follows a modern-day troupe of performers who live by medieval guidelines inspired by the stories of King Arthur, who use all the weaponry one would expect of knights and kings, but instead of horses their steeds are motorcycles. 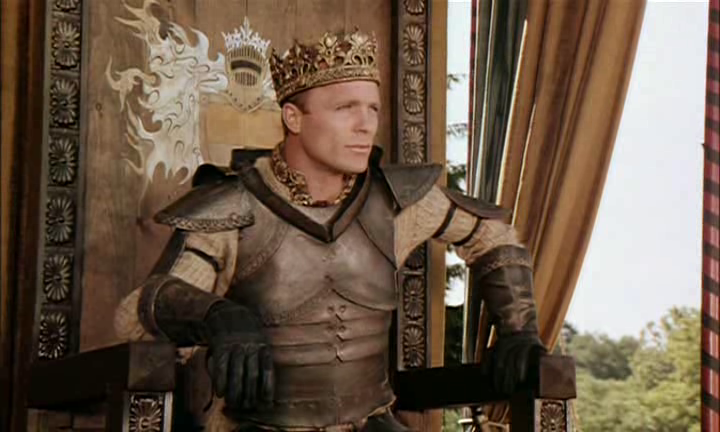 Ed Harris leads the group as King Billy. They travel from town to town, putting on jousting and combat shows and living on whatever meager money they make. Unfortunately there are divisions forming in the group, caused by Morgan (special effects and make-up wiz Tom Savini), who is being seduced by the call of fame and easy money by selling out their principles. Billy is haunted by the dreams of a raven, and believes he has to beat it, causing him to cling to all of his ideals, even if it costs him personally. 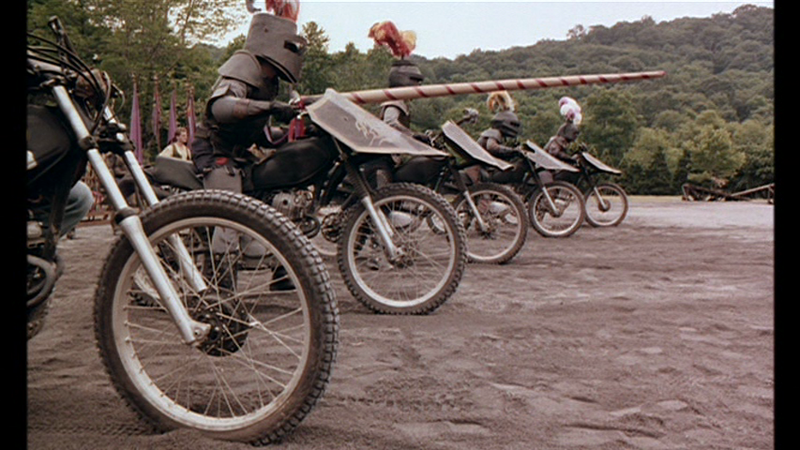 The stunt sequences are fantastic, with bikes dueling and jousting, while the crowds cheer them on (including Stephen King during the opening sequence). They are wonderfully choreographed and executed, and consequently I found myself really getting into the film. Ed Harris has always been a fave and he plays Billy perfectly, a blend of idealism and humanity. His council includes his wife, Linnet (Amy Ingersoll) and his own Merlin (Brother Blue). The film, clocking in at 2 1/2 hours, which doesn’t feel like it at all, allows for character development and moments for each and every member of the cast which includes Patricia Tallman, Martin Ferrero, Gary Lahti, Christine Forrest and Cynthia Adler. The story has the troupe clashing with the law (though in this case the local police are kind of corrupt), infighting, rescuing damsels like Julie (Tallman) from abusive homes (kind of), dealing with agents (Ferrero) and trying to survive in the modern world. 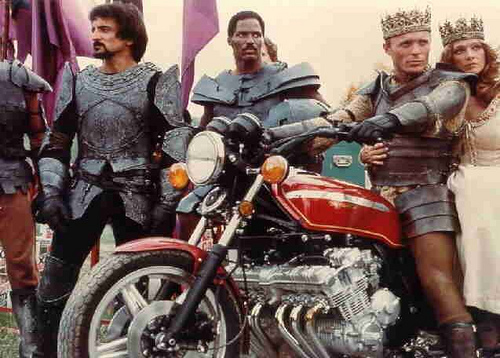 It works as a wonderful film, and I loved the combination of the old, jousting and the like, with the new, motorbikes. It just works, and is probably one of Romero’s strongest films, I was completely floored by how much I enjoyed it. It’s also fun watching the way both of the major leads, Harris and Savini, change and develop through the course of the film, Billy realizes he has to let go, and Morgan realizes that perhaps the lure of easy fame isn’t what he’s really about. As mentioned the stunt sequences are fantastic! The fights are long and involved, with a variety of weapons and bikes, and the final duel, the battle for the crown is simply stunning. I was completely engrossed. and oh the ending. Loved it! Did you see it? What’s your fave Romero flick?